I remember seeing the trailer for Hugo while waiting for Tintin to play in South Africa and thinking: "I have the watch this." 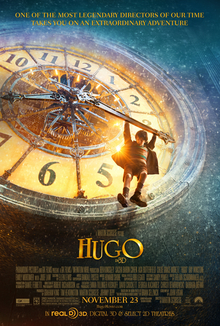 I had no clue what Hugo was about, yet the imagery was so spectacular that I really wanted to watch it. Well I've finally done that now. It's impressive, but it's also not without its faults. This is one of the few occasions when I can say that the nominations for this year's Oscars is not so bad, seeing as Hugo got 11 nominations. Based on the novel The Invention of Hugo Cabret, the movie centres around a kid living in a main Paris train station taking care of the station's many clocks. He also steals to make living after his uncle abandoned him in the walls of the station. The story is, in all, a sad one. It's about a child finding closure and finding a purpose in life. But the sub story, one of even harsher realities of the early 20th century and the eventual redemption, came quite a bit later in the film. It's the story of famed French filmmaker and pioneer, George Melies. Not only is George one of the seminal movie makers of his time, but indeed, he pioneered techniques still used in modern cinema nearly a hundred years later. His career on film was tragically cut short when he impending Great War which plunged much of Europe into turmoil. When the war ended, Melies thought he was not able to entertain anymore seeing as how the returning soldiers have seen so much more in reality during the wars. The story goes that he ended up running a toy shop and spent much of his later life in poverty - much of this is actually true although the movie is more fiction and mystery. So the stories in this film are great. The imagery did not disappoint from the trailer. It's super pretty everywhere you look. The only fault I can see is the twice or three times when Scorsese filmed a CGI of clock gears which then transitions into the Paris streets. It seemed strangely out of place and unnecessary. What really did bug the hell out of me was the dialogue. This is an English language film set in Paris. But some characters were written to speak in such unnatural English it made the whole thing seem like an act. English speakers do not use such flowery - and rather old fashioned - words as the French do. Yes, one of the characters doing this was that of the Station Inspector. I do believe he was trying to sound of much higher class and much more important than he really is, but his part is adding very little to the film and it was really not necessary! With a hugely impressive cast including Christopher Lee, Ben Kingsley and Jude Law, the weakest character also happened to be the one of the Inspector. I'm sorry, I loved Borat. I also loved Ali G. But Sacha Baron Cohen was just extraordinarily bad in this film. If the other actors didn't pull their weight, I would probably have really hated this movie. I have to say though, the child actors were really quite impressive. Their range of expressions and their abilities to act gives quite some hope for the future of cinema, even as this is a movie about the history of cinema. It's a real pity then, that the film tanked in the box office. It's a big budget, amazing production. It could have been better if some of the casting could be improved. Still a fascinating watch though.